You will probably recognize the names of D and D's featured artists...Dean Mathis and Don Mason have been entertaining folks across the U.S. for more than 30 years. Now they've teamed up to produce a show designed specifically to entertain residents of Nursing Homes and Retirement Centers. Their Hayride Sunshine Show is designed to make their audiences feel good. Concentrating on Country Classics and Old-time Rock 'n Roll, these talented entertainers bring back wonderful memories and provide uplifting, toe-tapping music for our honored elders. You may remember Dean Mathis as one of the Newbeats. Their number one hit "Bread And Butter" topped the charts around the world in 1964. The group's music remains popular today and their songs are featured in several recent movies. Don Mason has performed in Clubs, Casinos and private functions across the U.S. and operated one of the area's premier nightclubs where he appeared nightly for many years. Dean and Don often work local residents into their shows by having them perform the parts of Grandpa Jones and Minnie Pearl. The fun generated by these two legendary comedians is contagious and lets the whole audience be involved in the show. Grandpa will talk about the "vittles" he will have for supper and how wonderful they will taste. His menus call up mental pictures of the great times when sharing food was a way of life. Country folks always had enough to share with friends and neighbors. "Howdee! I'm just so proud to be here!" The same question is always asked after each performance. "When are you coming back to do another show for us?" Once you see the show, you'll look forward to the next time too! The audience always has a great time and loves to join in the show. 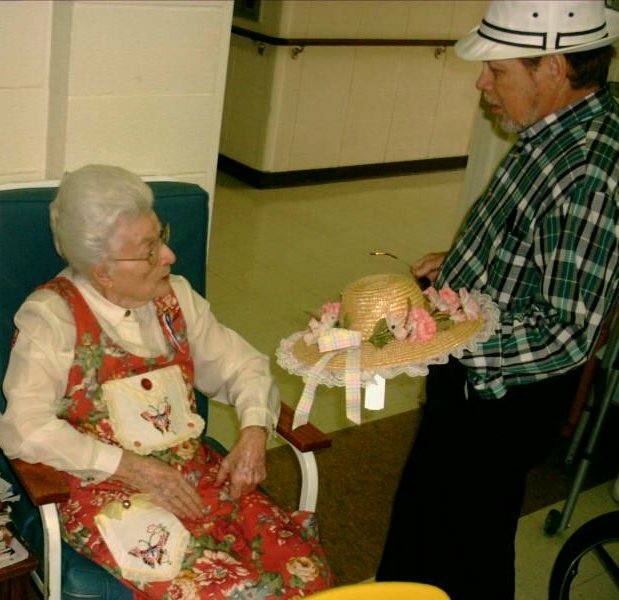 Dean and "Minnie Pearl" in Homer.